The Japanese automaker's new CEO has been beating Wall Street's expectations, and investors want a piece of the action. Since taking the top job in 2015, Honda CEO Takahiro Hachigo has been working to transform Honda's global operations, with (so far) impressive results. Image source: Honda Motor Company. This has been a tough year for most auto stocks. Fears of a peaking U.S. market and increasing pressure on prices in China have investors concerned that profits could be squeezed before long. But recently, shares of Honda Motor Company (NYSE:HMC) have bucked the trend. Honda's share price jumped 13.6% in August. What drove that return? As you can see, Honda's share price rose steadily through the month. But the steepest part of the curve happened in the first few days of August. What happened is that Honda's earnings report, issued on Aug. 2, beat Wall Street's estimates. Honda's net income for the quarter ended June 30 was 174.7 billion yen ($1.7 billion), well ahead of Wall Street's 134.6 billion yen average estimate as reported by Bloomberg. That profit was driven in part by a 4.4% year-over-year gain in U.S. sales during the quarter, much better than the slight decline expected by analysts. It was also better than the overall market's sluggish 0.7% gain. Honda also reported better-than-expected sales from China, where many global automakers have faced increasing pricing pressure from fast-improving domestic Chinese producers. Somewhat surprisingly for a company like Honda, which built its reputation on its reliable and efficient sedan models, its recent success is largely due to the popularity of its crossover SUVs. Consumers around the world are increasingly favoring crossovers over sedans, a trend that has been a boon for some automakers and a headache for others. To its credit, Honda has moved to make the most of the shift. In China, demand has been strong for its small Vezel and XR-V crossovers despite fierce domestic competition in the small SUV segments. The Vezel and XR-V are siblings of the U.S.-market HR-V, all derived from the same architecture that underpins Honda's subcompact Fit sedan. All three have received strong reviews around the world. The small Honda HR-V and its Vezel and XR-V variants have been strong sellers around the world. Image source: Honda Motor Company. The HR-V has done well in the U.S., too. But the biggest story for Honda here has been the one-size-up CR-V crossover, a perennial favorite. The CR-V's sales growth in the U.S. was stalled for a while because of tight supplies: Consumers were snapping up every CR-V that Honda could make. That's a happy problem for an automaker to have -- but Honda has been able to increase CR-V supplies somewhat in 2016, helping to satisfy demand and giving the model some year-over-year growth from levels that were maxed out a year ago. The CR-V was America's top-selling crossover in both July and August, sustaining the sales strength it showed during the April-to-June quarter. U.S. sales of the CR-V were up another 5% last month. So is Honda a buy now? Honda has been executing well under CEO Takahiro Hachigo, who took over last year and promised to give the proud automaker a global overhaul centered on innovative new products. The first of those, an all-new version of the Civic sedan, has been well-received. New versions of the CR-V and Accord sedan are coming, and Hachigo has promised attractive designs with plenty of advanced technology. The all-new Honda Civic has done well in its first months on the market. Image source: Honda Motor Company. Under Hachigo, Honda appears to be headed in the right direction. But the stock might be a little expensive right now: At about 10.5 times projected earnings for the coming year, it's probably fully valued -- and much more expensive than shares of some rivals, including General Motors (NYSE:GM) and Ford (NYSE:F). Honda's dividend yield of 2.6% isn't really enough to sweeten the offering. Long story short, I'd probably look elsewhere for an auto investment right now. But if you already hold Honda shares, you've got to be pretty happy about the price movement in August -- and about the strong results delivered so far by Hachigo and his team. 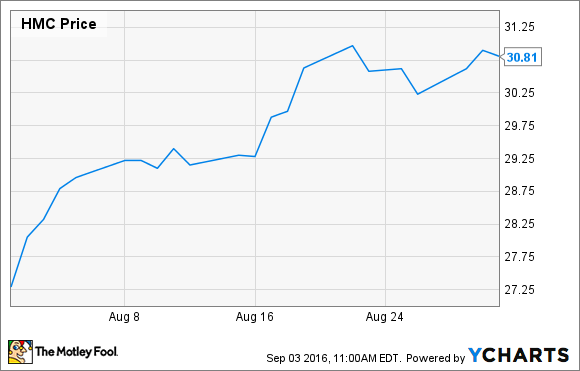 Is Honda's 3.5% Dividend Yield a Safe Bet?